The year 2013 will, in all likelihood, show 100 million more smartphone-based platforms than PC-based access platforms [Gartner]. The web is becoming increasingly accessible with the introduction of web-enabled smartphones. 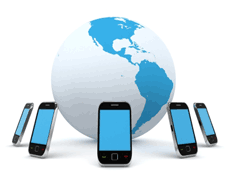 The mobile web has enabled the consumer to access the Internet practically anywhere they can carry their phones. The year 2013 will, in all likelihood, show 100 million more smartphone-based platforms than PC-based access platforms [Gartner]. That’s huge- more mobile than desktop. Here at ACI, we can take your existing website and make it mobile friendly. Working on a new website? You’ll want to keep mobile users in mind. This means structuring your essential mobile content so that people on the move can quickly find what they are looking for and will call or visit you immediately. This doesn’t mean doing without on your desktop website; it means building views that adapt to the browser device, large or small. Going beyond the web, there may be key components of your business that could be built into a mobile app. What if customers could download your app and obtain one-button mobile access to their latest order status? It’s all about connecting with your customers and making their lives easier, building loyalty to your brand. Are the majority of your customer phone calls asking about account balances, business hours, or your location? What is your time worth? ACI and New River Mobile work closely with you to develop integrated mobile solutions, on the web and native mobile applications.